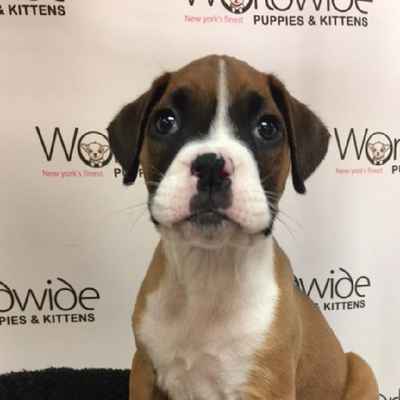 The Boxer has a life expectancy of 11-14 years and is prone to bloat, cancer, tumors, progressive retinal atrophy, cardiomyopathy, epilepsy, allergies, arthritis, hip dysplasia, knee and back problems and excessive flatulence. 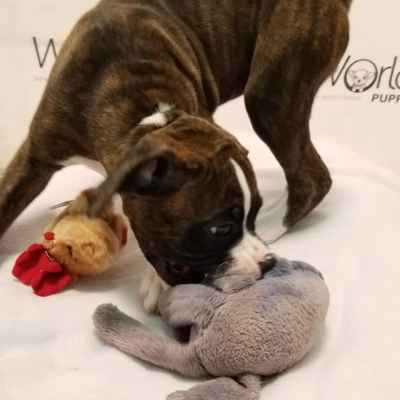 The Boxer is known for being gentle and patient with children, however no child should be allowed to abuse your Boxer by climbing all over him or her, pulling ears and tails, grabbing toys from the dog, etc. All children need to be respectful of all dogs. 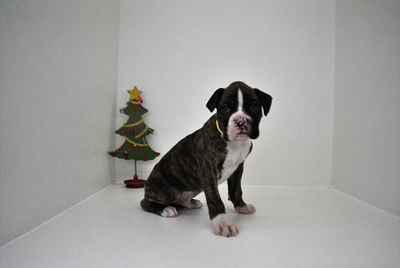 However, your Boxer is highly affectionate and loyal, playful and happy. They are exuberant and energetic, known for using their paws as if sparring, so you will need to be careful of their unintentional actions when playing with children. They love to jump and you will need to teach your Boxer how to stop that natural behavior. Great both as watchdogs and guard dogs, they are wary of strangers but very friendly with those people who are familiar. You will need to be a consistent and committed leader using humane communication and training techniques. Your Boxer will want to bond with you and using humane techniques will make your relationship stronger and most successful. The Boxer is an athlete. This breed needs daily exercise such as a brisk walk, run or jog in addition to off leash play in a safe area. Grooming Requirements: Requires regular brushing and bathing. Coat: Short and smooth Shedding: Average shedding Hypoallergenic: No Apartment Living: Good for apartment living if they are exercised daily Lap Dog: No Good With Children: Good with all children Good With Other Pets: Good with most other pets when well socialized at an early age, but should not be left alone with small non-canine pets. This breed can also be prone to aggression toward other dogs. 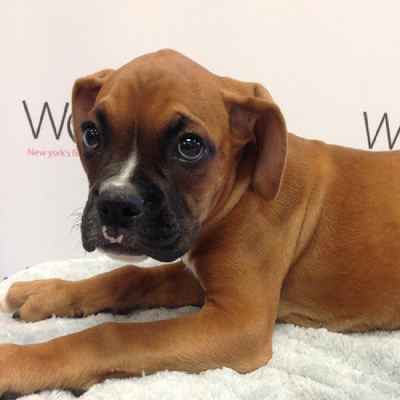 General Appearance: The ideal Boxer is a medium-sized, square-built dog of good substance with short back, strong limbs, and short, tight-fitting coat. His well-developed muscles are clean, hard, and appear smooth under taut skin. His movements denote energy. The gait is firm yet elastic, the stride free and ground-covering, the carriage proud. Developed to serve as guard, working, and companion dog, he combines strength and agility with elegance and style. His expression is alert and his temperament steadfast and tractable. The chiseled head imparts to the Boxer a unique individual stamp. It must be in correct proportion to the body. The broad, blunt muzzle is the distinctive feature, and great value is placed upon its being of proper form and balance with the skull. In judging the Boxer first consideration is given to general appearance and overall balance. Special attention is then devoted to the head, after which the individual body components are examined for their correct construction, and the gait evaluated for efficiency. Adult males 23 to 25 inches; females 21½ to 23½ inches at the withers. Proper balance and quality in the individual should be of primary importance since there is no size disqualification. Proportion - The body in profile is square in that a horizontal line from the front of the forechest to the rear projection of the upper thigh should equal the length of a vertical line dropped from the top of the withers to the ground. Substance – Sturdy, with balanced musculature. Males larger boned than females. The beauty of the head depends upon the harmonious proportion of muzzle to skull. The blunt muzzle is ⅓ the length of the head from the occiput to the tip of the nose, and ⅔ the width of the skull. The head should be clean, not showing deep wrinkles (wet). Wrinkles typically appear upon the forehead when ears are erect, and are always present from the lower edge of the stop running downward on both sides of the muzzle. Expression - Intelligent and alert. Eyes - Dark brown in color, frontally placed, generous, not too small, too protruding, or too deep set. Their mood-mirroring character, combined with the wrinkling of the forehead, gives the Boxer head its unique quality of expressiveness. Third eyelids preferably have pigmented rims. Ears - Set at the highest points of the sides of the skull, the ears are customarily cropped, cut rather long and tapering, and raised when alert. If uncropped, the ears should be of moderate size, thin, lying flat and close to the cheeks in repose, but falling forward with a definite crease when alert. Skull - The top of the skull is slightly arched, not rounded, flat, nor noticeably broad, with the occiput not overly pronounced. The forehead shows a slight indentation between the eyes and forms a distinct stop with the topline of the muzzle. The cheeks should be relatively flat and not bulge (cheekiness), maintaining the clean lines of the skull as they taper into the muzzle in a slight, graceful curve. Muzzle and Nose - The muzzle, proportionately developed in length, width, and depth, has a shape influenced first through the formation of both jawbones, second through the placement of the teeth, and third through the texture of the lips. The top of the muzzle should not slant down (downfaced), nor should it be concave (dishfaced); however, the tip of the nose should lie slightly higher than the root of the muzzle. The nose should be broad and black. Bite and Jaw Structure - The Boxer bite is undershot, the lower jaw protruding beyond the upper and curving slightly upward. The incisor teeth of the lower jaw are in a straight line, with the canines preferably up front in the same line to give the jaw the greatest possible width. The upper line of the incisors is slightly convex with the corner upper incisors fitting snugly in back of the lower canine teeth on each side. Neither the teeth nor the tongue should ever show when the mouth is closed. The upper jaw is broad where attached to the skull and maintains this breadth, except for a very slight tapering to the front. The lips, which complete the formation of the muzzle, should meet evenly in front. The upper lip is thick and padded, filling out the frontal space created by the projection of the lower jaw, and laterally is supported by the canines of the lower jaw. Therefore, these canines must stand far apart and be of good length so that the front surface of the muzzle is broad and squarish and, when viewed from the side, shows moderate layback. The chin should be perceptible from the side as well as from the front. Any suggestion of an overlip obscuring the chin should be penalized. Neck - Round, of ample length, muscular and clean without excessive hanging skin (dewlap). The neck should have a distinctly arched and elegant nape blending smoothly into the withers. Back and Topline: The back is short, straight, muscular, firm, and smooth. The topline is slightly sloping when the Boxer is at attention, leveling out when in motion. Body - The chest is of fair width, and the forechest well-defined and visible from the side. The brisket is deep, reaching down to the elbows; the depth of the body at the lowest point of the brisket equals half the height of the dog at the withers. The ribs, extending far to the rear, are well-arched but not barrel-shaped. The loins are short and muscular. The lower stomach line is slightly tucked up, blending into a graceful curve to the rear. The croup is slightly sloped, flat and broad. The pelvis is long, and in females especially broad. The tail is set high, docked, and carried upward. An undocked tail should be severely penalized. The hindquarters are strongly muscled, with angulation in balance with that of the forequarters. The thighs are broad and curved, the breech musculature hard and strongly developed. Upper and lower thigh are long. The legs are well-angulated at the stifle, neither too steep nor over-angulated, with clearly defined, well "let down" hock joints. Viewed from behind, the hind legs should be straight, with hock joints leaning neither in nor out. From the side, the leg below the hock (metatarsus) should be almost perpendicular to the ground, with a slight slope to the rear permissible. The metatarsus should be short, clean, and strong. 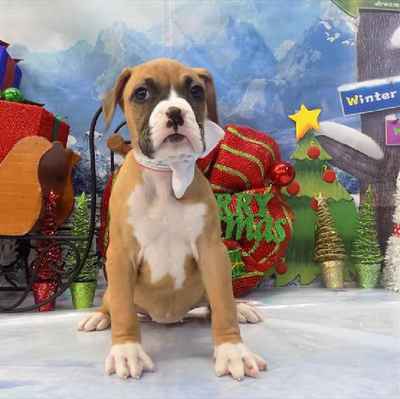 The Boxer has no rear dewclaws. 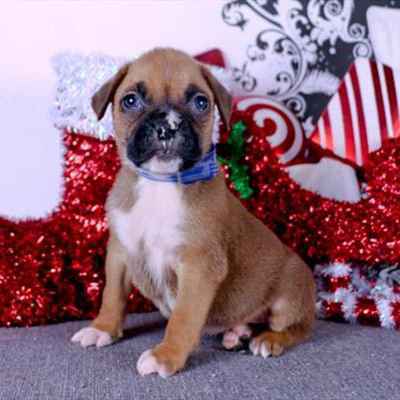 Boxers that are any color other than fawn or brindle. 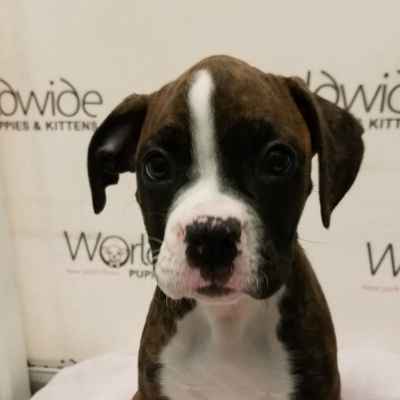 Boxers with a total of white markings exceeding one-third of the entire coat. The foregoing description is that of the ideal Boxer. Any deviation from the above described dog must be penalized to the extent of the deviation. 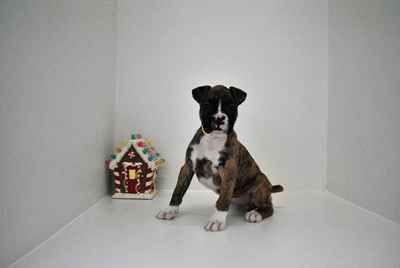 The colors are fawn and brindle. Fawn shades vary from light tan to mahogany. The brindle ranges from sparse but clearly defined black stripes on a fawn background to such a heavy concentration of black striping that the essential fawn background color barely, although clearly, shows through (which may create the appearance of reverse brindling). White markings, if present, should be of such distribution as to enhance the dog's appearance, but may not exceed one-third of the entire coat. They are not desirable on the flanks or on the back of the torso proper. On the face, white may replace part of the otherwise essential black mask, and may extend in an upward path between the eyes, but it must not be excessive, so as to detract from true Boxer expression. The absence of white markings, the so-called "plain" fawn or brindle, is perfectly acceptable, and should not be penalized in any consideration of color. 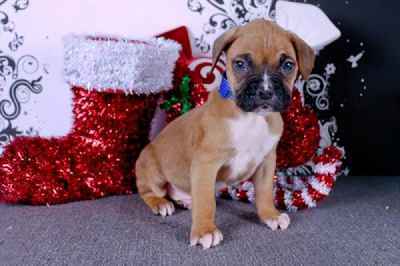 Disqualifications Boxers that are any color other than fawn or brindle. 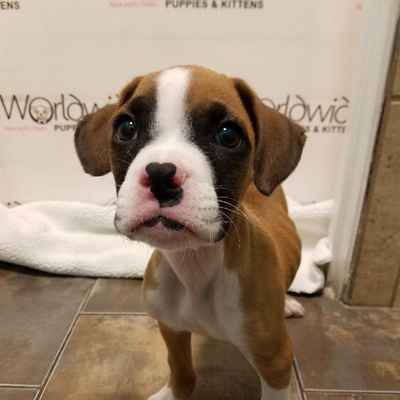 Boxers with a total of white markings exceeding one-third of the entire coat. A Boxer plays Hank in CSI. There are two types of Boxers: the American Boxer and the German Boxer. The German Boxer has a more muscular body and a larger head than the American Boxer.